This summer I was commissioned to illustrate an article for Clubhouse magazine. 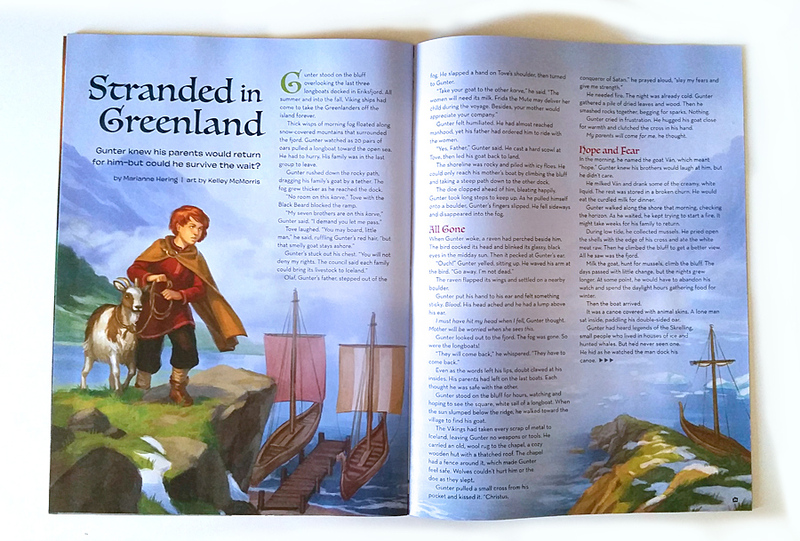 When I read the article I was very excited because it was about Vikings, and I happened to be traveling through Viking country at the time - specifically Sweden! Obligatory vacation photo! 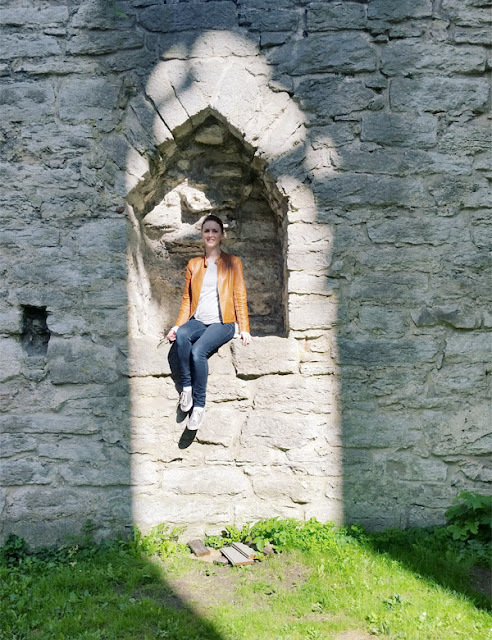 This is me exploring the ruins of a cathedral in the town of Visby. As you can see I'm using directional light to establish myself as a focal point. My husband and I joked that maybe this assignment would allow us to write off our whole Sweden trip as a "business expense" for "research." Obviously we didn't do that, but when I saw that the Stockholm History Museum had a Viking exhibit going on, I figured my museum admission could be considered a legitimate business expense. Turns out admission was free. I've never been so disappointed to NOT pay for something. 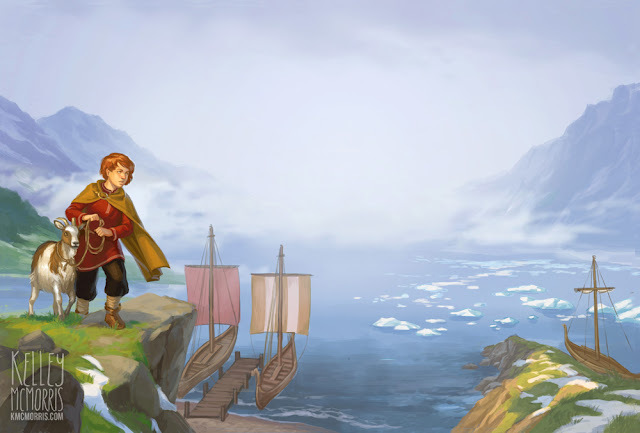 Initially the art brief asked for a full-page illustration of the main character, Gunther, with his goat, three Viking longships, and the Greenland fjord during summer. 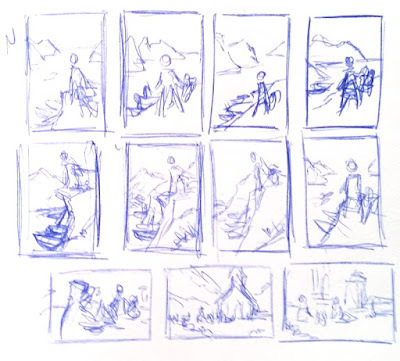 As I started sketching thumbnails, I was struggling to fit all these elements into a vertical format, especially the fjord. 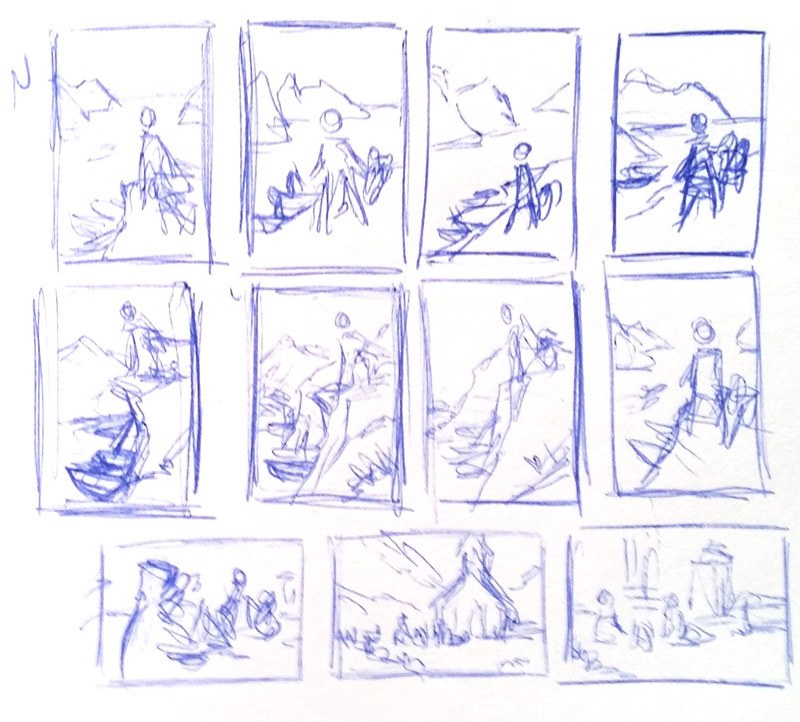 Fjords are wide and spacious, but my sketches were feeling cramped. 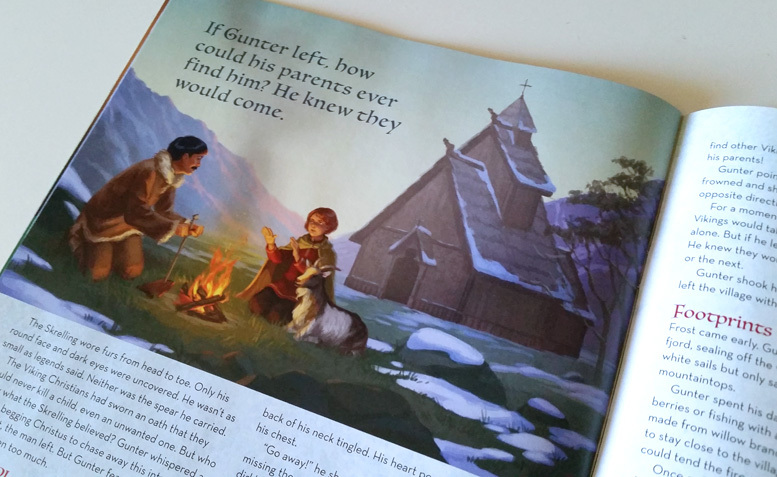 The art director, Jenny Dillon, had mentioned that the format was flexible. I took a chance and asked if, instead of drawing one full-page illustration, I could draw an illustration that spanned two half-pages. I was thrilled when she gave me permission to do whatever I wanted with the format. I literally clapped my hands in glee. Horizontal formats? Double-page spreads? EEEEEEEEE! This is the most obscure kind of nerdiness, I don't even know what to call it. Why do you guys even read this blog? 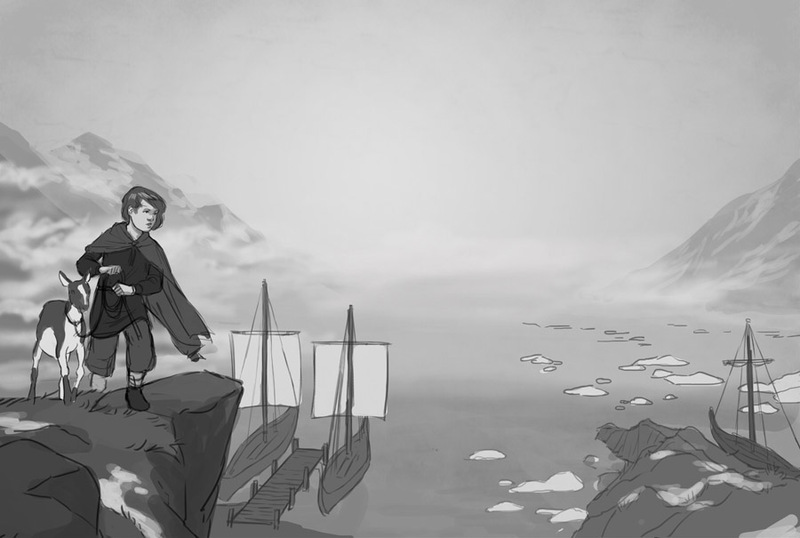 Here's the rough I sent to the AD. There was also a secondary illustration of an eskimo teaching Gunther how to build a fire in front of a stave church. I quickly got permission to go to final, so now it was time to have fun with the colors. 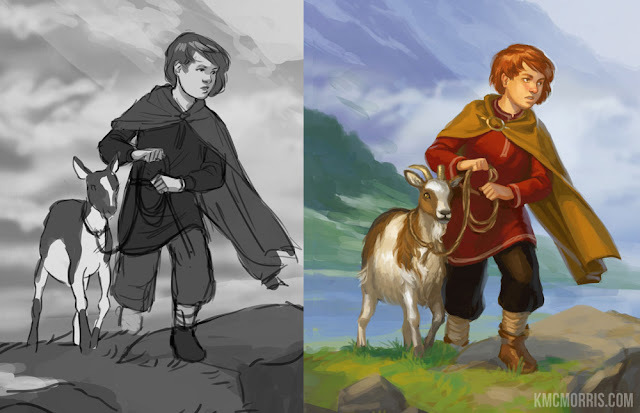 While I was painting the main characters I realized that I had neglected to do any research into what types of goats Vikings might have owned. The breed of goat I originally sketched was a Nubian goat, which is a very cute breed, but the breed originated in the 19th century. After some Googling I discovered a breed called "British Primitive Goats" which were probably closer to the types of goats Vikings would have owned. 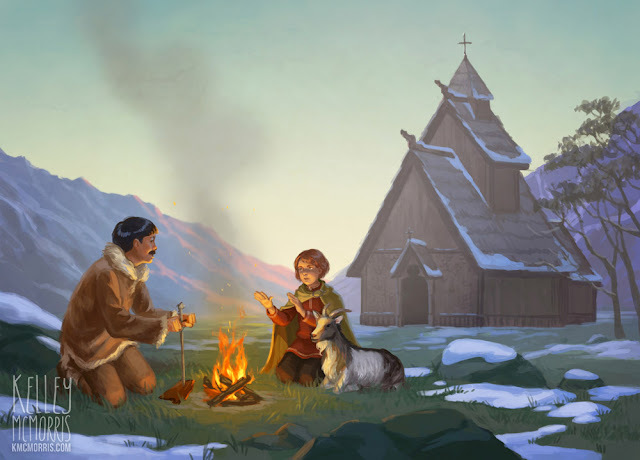 For the secondary illustration, the emphasis would be on the contrast between the warm fire and the cold environment. 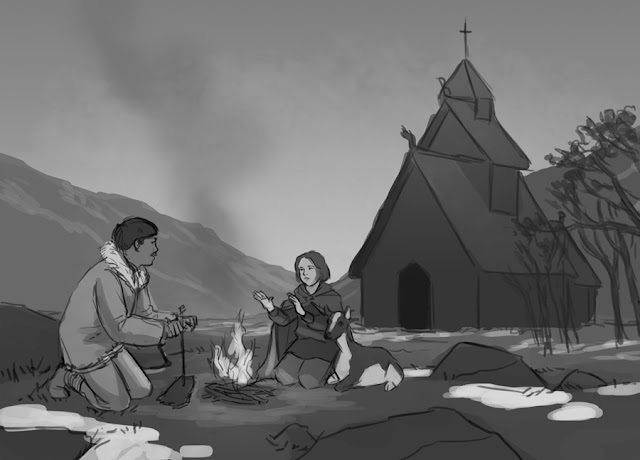 In order to keep it from being too similar in color to the first illustration, I set the scene in the early morning, so I could work some pinks, purples and yellows into the environment. I eagerly awaited my copies of the magazine. I was curious to see how the double-page spread would turn out. I got my copies just a few days ago and it looks great! This was a lot of fun to do and I'm really happy with how it turned out! If you read all the way to the end of this blog post, you are a truly dedicated Kelley McMorris fan. Hi mom! Hi, Kelley! Very beautiful illustrations!